Despite the political squabbles that have produced dramatic media coverage — and even a full government shutdown — the Affordable Care Act without a doubt benefits students more than any other group in America. 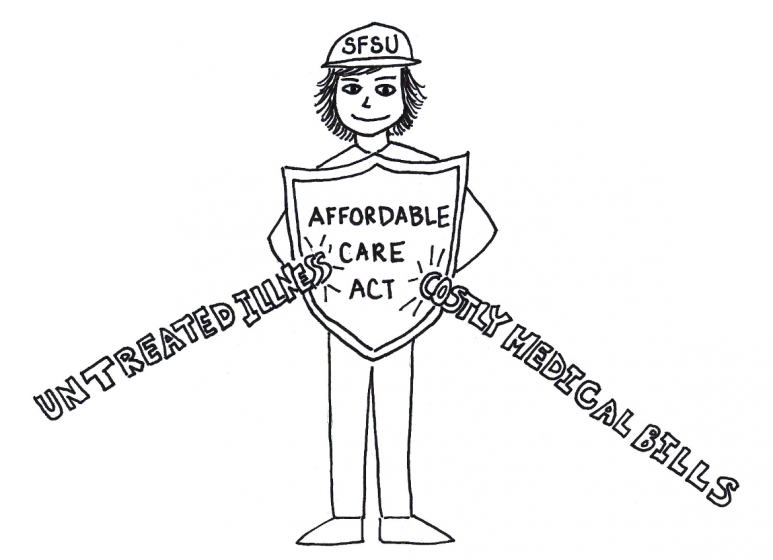 Countless students at SF State are affected by the law’s implementation in the coming months. Many of us benefit from the provision of extended coverage under our parents’ plans to age 26. This means we will not be deciding between government healthcare or paying a penalty within the next several months. For those over 26, or under that age but have no parental coverage, the provisions in the law make health insurance more attainable by the expansion of Medicaid. The act also ensures that what individuals pay for actually delivers better health — and more cost-effectively — something all students can benefit from. Being healthy is one of the pivotal points of success for any college student, and securing adequate health care should be one of our top concerns. In times where many of us take on student loans and live on fixed budgets around little-to-no income, having insurance, in emergency situations, can save us from falling into a worse financial hole. Just as much so, taking preventive measures to ensure our health can ultimately save us cost and worry as we pursue higher education. The HealthCare.gov website highlights services like HIV testing, immunization vaccines, cancer screening, and addiction support, which are now required to be covered by health insurance companies without charging consumers out-of-pocket. These preventive services can cost hundreds of dollars, and are often not taken advantage of because of their cost. With wider availability and inclusion in health coverage, their use has increased. The Times Dispatch reported that since the Affordable Care Act was signed in 2010, cancer screenings and vaccinations have risen in use as health insurance companies are now covering preventive services. The expansion of Medicaid to allow more Americans than ever to access low-cost or free healthcare also benefits those students who find themselves requiring health insurance. In an article by the University of Buffalo, Nancy Nielsen, MD, a UB senior associate dean and past American Medical Association president, argues that the health law benefits those who previously could not afford healthcare. Many argue that the Affordable Care Act unfairly forces people to purchase health insurance, or face a fee, causing further financial harm than good. Conversely, the cost of not having health insurance can far outweigh the $95-$695 penalty one would pay to not purchase health coverage. The Atlantic reported that the average cost of an emergency room is $2,168, with costs as much as $4,000 depending on the issue. A Consumer Reports survey found that many Americans offset doctors visits, avoided filling prescriptions, or picking and choosing what bills to pay because of the rising cost of prescription pills. The hard fact of life is that we all get sick and when we do, we don’t expect it. Whether that be a trip to the emergency room, or a last-minute surgery, the fragility of human health should never be underestimated, nor the cost of not having insurance to back you up. Though young adults tend to be generalized in the healthiest age demographic, our active lives and often heavy schedule loads can take a burden on our health, and take us down when we least expect it. The Affordable Care Act is a step in the right direction for getting students equipped with proper health coverage for not only the worst situations, but preventing the worst situations from ever happening. As a relatively young, healthy, uninsured person, being forced to buy overpriced insurance I don’t want is going to screw me. Thanks a lot, Obama. Maybe I’ll just pass. I say let anybody provide health care without any government interference, and people can read the reviews on Yelp and other sites when shopping around so that they find reputable services. There’s no reason for somebody who’s going to be treating one thing to be forced to learn all this extraneous stuff in medical school and health care consumers be forced to cover all the added expenses of the doctor and nursing cartels.